The Smithsonian Air and Space Museum opening hours are from 10:00 AM to 5:30 PM most days of the year. During summer and on many busy weekends during the year, there are Air and Space Museum opening hours are extended until 7:30 PM. The museum is open every day of the year except Christmas Day. Entry is always free to all exhibits. However, there are also some paid activities at the Air and Space Museum. First, there is the IMAX theater — the Air and Space Museum shows several different IMAX movies during the day. Adults pay $9 and children pay $7.50. The Planetarium has several shows as well. The ticket prices are also $9 for adults and $7.50 for children. There is also a flight simulator, which is very popular. The cost for the flight simulator is $7. Every Smithsonian Museum is handicapped accessible. There are two entrances to the Air and Space Museum. Enter via the Jefferson Drive entrance for wheelchair ramp access. On Jefferson Drive, there are also several handicapped parking spaces available. 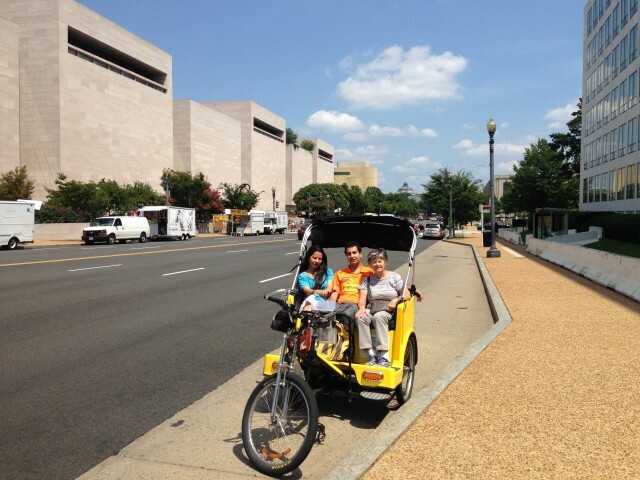 There is metered 3 hour parking on Madison and Jefferson Drives that pass in front of many of the museums on the National Mall. Make sure you read the signs, as not every parking spot on these two streets are available for the general public. Never park in a handicapped spot on the National Mall. You will get a ticket for $250. There is also parking on some of the cross streets, such as 3rd, 4th, 7th and 14th Streets. On 7th and 14th, this is non-rush hour parking. Read the signs if you do not want to be ticketed. There are two commercial parking garages on 6th and C Streets SW not far from the Independence Avenue entrance to the Air and Space Museum. The nearest Metro station is the L’Enfant Plaza Metro. This is only 2 blocks away from the entrance to the Air and Space Museum. Smithsonian Metro is the equivalent of 6 blocks away. Both of these Metro stations are on the Blue/Orange/Silver lines. You can visit the Smithsonian Air and Space Museum website for more information and a timetable for IMAX and Planetarium shows.